Eliminate fossil fuels and the next thing you know, kids will be smoking pot in the streets. Meet my new Green Dealer. Gov. Andrew M. Cuomo announced that he would push to legalize recreational marijuana next year, a move that could generate more than $1.7 billion in sales annually and put New York in line with several neighboring states. New York Gov. Andrew Cuomo, D, on Monday pledged to bring New York to 100% carbon-free electricity by 2040 in a speech laying out his agenda for the first 100 days of 2019. The pledge follows the New York Public Service Commission’s Friday order approving plans to implement the third stage of its Clean Energy Standard (CES), which aims to reduce greenhouse gas emissions 40% by 2030 and 80% by 2050, with 50% of the state’s electricity coming from renewables by 2030. And on Thursday, the commission approved the most ambitious energy storage target in the country — 3 GW by 2030 and 1.5 GW by 2025 — as well as a target aimed at doubling utility energy efficiency progress by 2025. Cuomo’s announcement adds to a growing number of state and city initiatives aimed at reducing carbon emissions, a response, in part, to federal inaction on climate change. As state leaders begin to tackle global warming on their own terms, many credit the groundwork that has already been laid in their state. Last week, Washington Gov. Jay Inslee, D, committed his state to 100% clean energy by 2045, saying the goal was only possible “because we have done smart things up until now,” including adopting a renewable portfolio standard, ramping up wind energy and adopting green transportation policies. In Illinois, Gov.-elect J.B. Pritzker, D, has called for his state to reach 100% renewables generation by 2050. The state generates over half its energy from nuclear power but has been ramping up its solar portfolio as it looks toward a pure renewables goal. New York, for its part, set its CES goals in August 2016, which “laid the groundwork to create enough renewable energy to meet half of the state’s electricity needs by 2030,” James Denn, public information officer for the New York PSC, told Utility Dive in an email. Along with its recent storage goals, New York recently issued an 800 MW offshore wind solicitation, part of Cuomo’s goal to develop 2,400 MW of offshore wind by 2030. That’ll be hundreds of millions in the next decades. There were already 24.2 million new displacements by disasters in 2016. And BTW, India shows a better climate performance than Europe. Watch it, Chucky! This looks very much like a Russian Troll message attacking the U.S. and doing Russia’s and China’s dirty work sowing seeds of doubt and dissension. 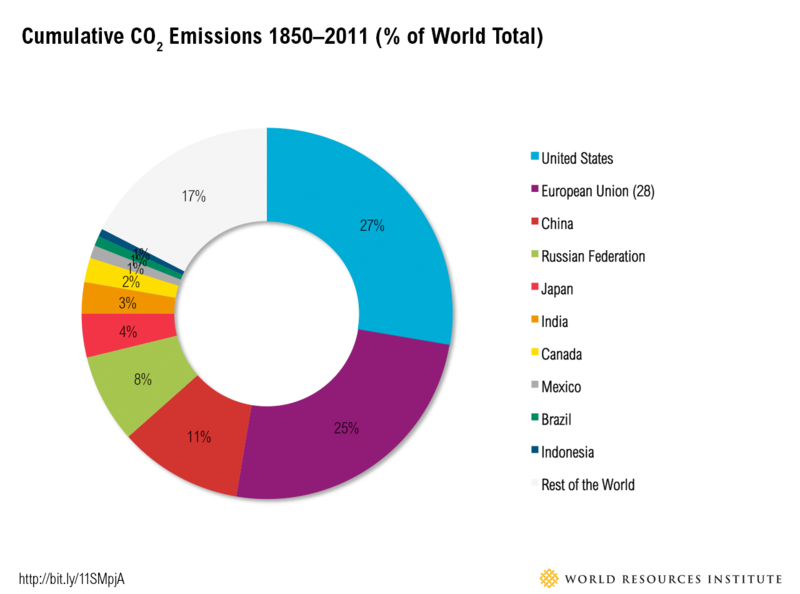 It’s not cumulative emissions that should be the focus but present and future emissions, and CHINA and India, with ~1/3 of the world’s population, will need to show a much better “climate performance” if we are to survive. Would you care to explain to us how “India shows a much better climate performance than Europe”? I don’t see it. The world’s continued reliance on coal was highlighted yet again this week, with a new report by the International Energy Agency (IEA). The IEA’s Coal 2018 report found that global coal demand grew by 1% in 2017 after two years of decline – and it is expected to continue rising this year, too. However, despite this recent growth, demand is still below the “peak” seen in 2014. Carbon Brief’s summary of the IEA report includes a chart showing how its forecasts for global coal demand have routinely been revised downwards over the years. Despite this, the new IEA report forecasts that global demand is likely to “remain stable” until 2023. This will, says the IEA, be largely due to falling demand in western Europe and North America being offset by growing demand in Asian countries, such as INDIA, Vietnam and Indonesia. A recent report from Nature Climate Change points out that the if the policies and actions of the US, USSR, China, Canada, Australia and other countries were followed by all, it would head us toward 4-5°C+ above preindustrial temperature, while India’s would lead us to 2.6°. We need to use every measure we can, but the international process, and internal US politics, have been emphasizing exactly the wrong statistics. It’s clearly being done for pathologically selfish and manipulative reasons in a monstrous game of chicken. And to mix metaphors, the rich countries have stacked the deck in their favor, as they have n in every way for 500 years. Quite a few relatively sane countries, intentionally and systematically deprived of wealth, sovereignty, and agency for those 5 centuries, have been saying all along we need to pay attention to differential responsibility, which lies much more with the developed countries. If the rich countries don’t cut their emissions to zero immediately, and at the same time aid in whatever way it takes to allow developing countries eliminate theirs, it’s unlikely civilization and millions of threatened species will survive. Correction: Report was in Nature Communications journal. “It’s insane to excuse the US’s enormous per capita and total cumulative emissions (still in the atmosphere warming the Earth) that have helped it get rich and dominate the world, while criticizing China”. Really? I don’t know who’s “excusing” the USA’s and EU’s sins of the past—-I know I’m not and don’t see any other Crockers doing it. What I DO “sanely” criticize is the compounding of those past sins by foot-dragging and not moving fast enough to cut emissions. We’re going to cut emission by X% by 2030-2040-2050? LMAO! Jeffy simply refuses to face the reality of what the FUTURE cumulative emissions of the 3+ billion people in China, India, SE Asia, and Indonesia are likely to be IF they proceed along the same path of capitalism/industrialization/globalization as the West has (as they show every sign of doing). Here’s a huge data mine for Jeffy to explore—-some of the graphs are interactive and display change through time beautifully with sliding cursor lines. He should look at the “per capita” data—-it’s jaw-dropping. Worldwide overall trends are uniformly UP due to economic and population growth, and what’s “insane” is to keep ranting without looking at that. PS I DO agree with the spirit of his last paragraph, if not its logic. « Remember “The Pause”? There Wasn’t One. But we Knew That.